The Okefenokee National Refuge is almost more a place of legend in the southeast instead of a physical space. We all grew up hearing about the Okefenokee swamp as the mythical place of alligators, fires, and the Skunk Ape. Not all of these things may be real but the Okefenokee is a real living breathing ecosystem that has more magic than Disney World. This place of wonder is where I spent my National Trails Day, along with family, loved ones, and hounds. We wanted to do something relatively easy for the occasion. 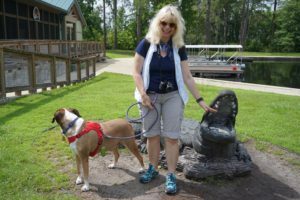 Nick and I have ventured into the swamp before, but it would be the first time for my mom and for the dogs. The first time I went was back in January 2017 on the foot trails and the second time in August of the same year exploring the waterways. 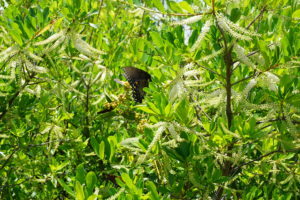 Throughout the visits it was interesting to note the changes in vegetation throughout the seasons. Unfortunately, this visit I wasn’t the most motivated individual to drive the hour and a half drive to the refuge which meant we arrived during the midday heat. The heat and high water levels also meant that seeing an alligator, was highly unlikely. We did assure my mom that even though we didn’t see one, it is highly likely one saw us. The heat also affected the dogs. Dogs are allowed in the refuge but only on certain trials. They enjoyed a great time exploring the outside area of the homestead and the adjacent hiking trail. Every once in a while, the breeze would cool us down, but overall the heat and humidity started taking a toll on us and the dogs. 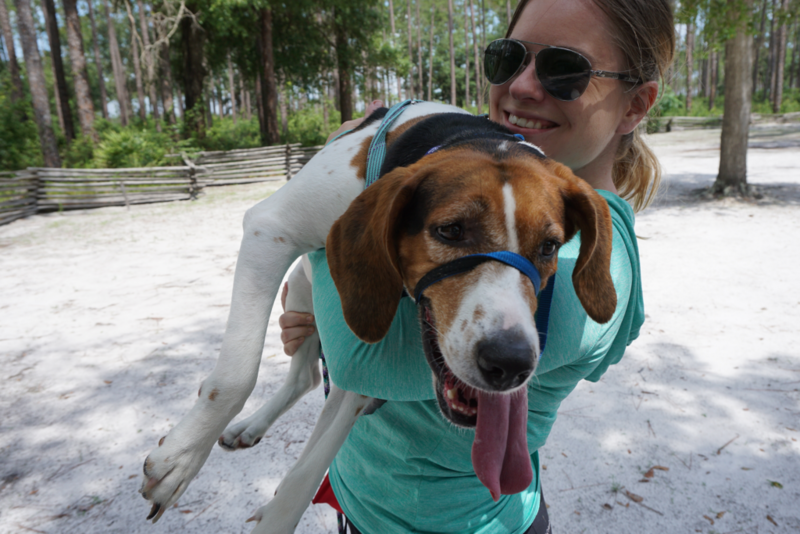 Hiking with dogs, also means making sure dogs are safe and checking they are not overheating and checking them for ticks. They gulped up water with every break we took, and after less than a mile it wasn’t safe for the dogs to stay in the heat. 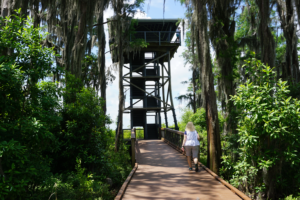 We got to the Jeep and made our way to the Boardwalk, which took us to the Lookout Tower. Sadly, dogs are not allowed there but in the state they were in the safety of the air conditioned Jeep was a better choice for them. Nick, traded in his hiking boots and put on his nightcap to keep the dogs company. My mom and I did a speed run of the boardwalk only stopping to take photos of the most beautiful flowers and water lilies. The ecosystem was full of life, with the plants being bright green covering up the burn marks of fires from previous years, We made our way back to the Jeep, and saw that the dogs calmed and cooled down in the air and that Nick had fallen asleep. Even though we would have loved to have taken the dogs with us, keep in mind the reason they weren’t allowed is important. 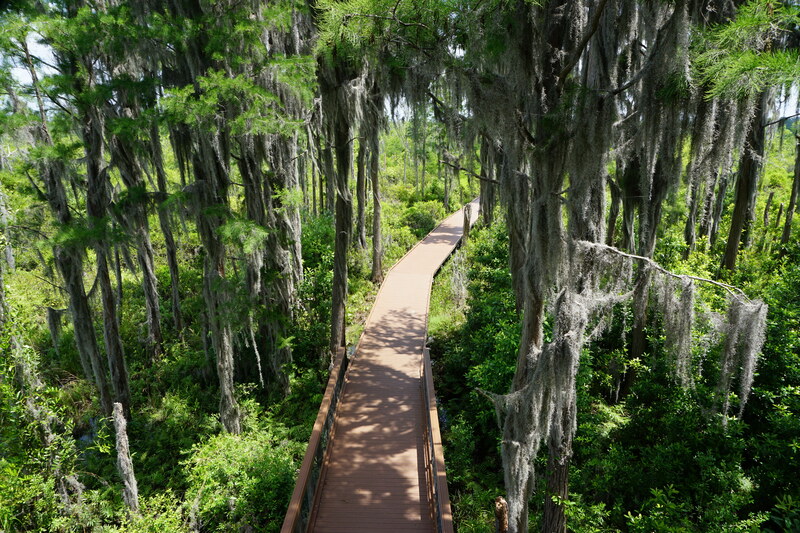 The Boardwalk is narrow and surrounded by swampy water by each side. In the water lays wild life that need the safety of distance and can easily turn aggressive with a water plunging dog. Also, bringing dogs makes it difficult for people to pass, creating another potentially hazardous situation. 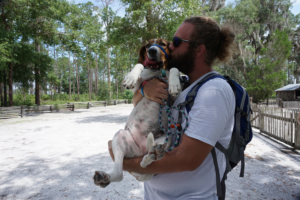 Rules and regulations on dogs, are in place not just for the safety of humans and wildlife but also to ensure that dogs are safe as well in the wilderness. The only wildlife we saw on the trail were terrapins and butterflies, but we all enjoyed our adventure. The staff at the Okefenokee National Refuge do an amazing job keeping it clean, so we only found a lens cap to throw away. However, since National Trails Day is not only about enjoying the trails but also about helping preserve them, I am hoping that people will heat my warning against bringing dogs into dangerous areas they are not allowed in. 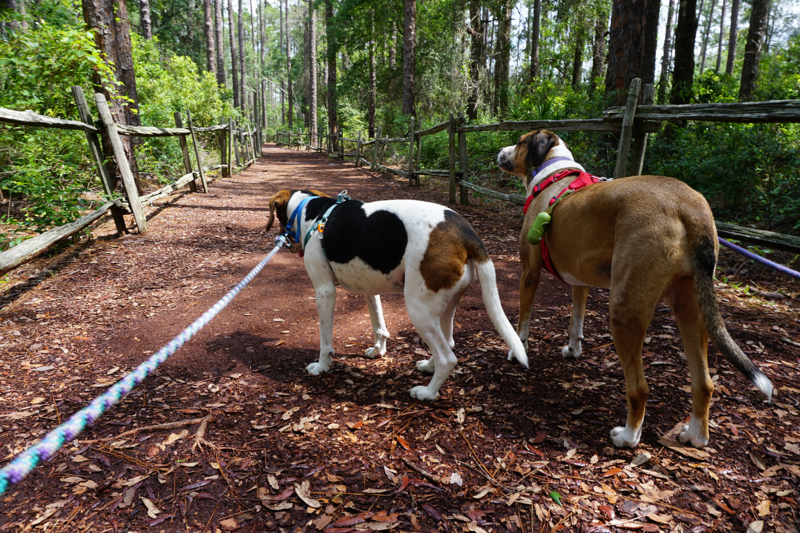 Preserve the trails, so they can be enjoyed by all and do your part to keep your K9 hiker safe.